This malware is the final payload to the recent BlackEnergy targeted attacks that affected industries in Ukraine. The threat actors behind this attack normally use Excel files as part of their social engineering lure. However, in this case, the document files are employed as ploy to trick users. This backdoor may be dropped by other malware. 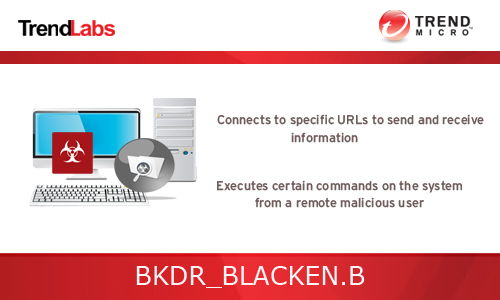 Restart in normal mode and scan your computer with your Trend Micro product for files detected as BKDR_BLACKEN.B. If the detected files have already been cleaned, deleted, or quarantined by your Trend Micro product, no further step is required. You may opt to simply delete the quarantined files. Please check this Knowledge Base page for more information.